This book is truly remarkable. It should help any of us to approach end-of-life matters in a better-informed, more constructive way. And although some of it is not easy reading - he really wants us to look ahead and consider our declining years, instead of whistling in the dark and pretending we're immortal - it is a life-enhancing book. 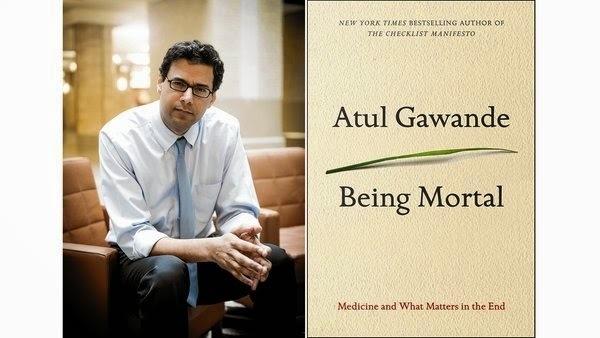 Atul Gawande gave this year's Reith Lectures, "The Future of Medicine,"on BBC Radio 4, still available on iPlayer of course, under "Reith Lectures." Time to roll out the big words - brilliant, humane, compassionate, hugely knowledgeable and experienced...do give him a try. Hear hear. Something in me was resistant to how I thought the book might have been written to have achieved such readability. But he's done it all the hard way: everyday vocab, a huge amount of distilled experience and wisdom, a hunger to learn from others; great storytelling, memorable characters and, without doubt, a good deal of perspiration. I love this book. And it really is hard to put down once you've started reading it. Someone called Gloria Mundi recommended it to me, and for that I thank her. Everyone should read this book because dying in the 21st century is so very hard to do. So pleased you found it valuable, Charles. Your last sentence should be on the dust cover of the book. Also pleased Gloria managed a few moments of sobriety in which to recommend it to you...!